Danilo is as inventive as ever as a pianist and improviser, but he's also still the generous individual that I met nearly 20 years ago. I've been meandering my way through this thing called the music business for nearly 30 years. It's really the only thing I know how to do, and it's certainly the only thing I want to do. I've seen a lot of excess and stupidity in that time, and participated in my share. More often, though, I've simply been lucky that working in this area in one capacity or another has continually exposed me to wonderful experiences and terrific artists. One of those artists is the Panamanian jazz pianist Danilo Pérez. I was introduced to him in January of 1997 at the Jazz Educator's Association conference in Chicago, and I was immediately struck by his warmth and generosity. I've seen him perform at three different incarnations of the Jazz Showcase; the present location, the space on Grand Avenue in River North and, before that, the faded and shabby elegance of the Blackstone Hotel before it was renovated. I even got to host an in-store performance by him in support of his CD Panamonk when I ran the music department at the sadly departed Borders store on Michigan Avenue. It's been over three years since I last saw him, so I was eagerly awaiting last night's performance at the Jazz Showcase for a few months. I was also fortunate that the Afro-Latin publication Agúzate let me write a show preview and review of his recent Panama 500 album, which you can read here. Writing that piece forced me to sit down and really listen to Panama 500 closely, and I was richly rewarded. Pérez is as inventive as ever as a pianist and improviser, but he's also still the generous individual that I met nearly 20 years ago. His band on this visit includes his long-time drummer Adam Cruz (phenomenal as always) and two fresh young musicians from Jerusalem. Bassist Tal Gamlieli stepped up solidly in place of Ben Street, and Roni Eytan's harmonica evoked at various times the string arrangements from Panama 500, hints of Panamanian style accordion and even tropical bird calls. Danilo led all three musicians in what was clearly a joyous adventure, onstage and off. Much of the evening was devoted to Panama 500, but the altered instrumentation and Pérez's intense need to open doors and explore ideas guaranteed that the approach to those songs was imbued with improvisational twists and turns. The same goes for his deep forays into Monk and Dizzy. Two sets, two-plus hours of music, exquisite 'til the very last note. Don: Panama has been a central subject of much of your music going all the way back to Panamonk, and what strikes me most is how little it sounds like what is commonly known as "Latin jazz." What's different about Panama? Danilo: Panama's strategic geographical position has allowed for the amalgam of many cultures. Panama is one of the most globalized countries in Latin America and therefore has a very rich and diverse history. The Bridge of the Americas located in Panama is a huge inspiration to me and I have been writing and performing music that is more related to global jazz using elements from Jazz, Classical and Latin American folkloric elements. Don: I hear so much of the 'indigenous' in your music, And although Caribbean culture often references the mix of European, African and indigenous cultures, for me the African and European influences seem to dominate in most music, but this is not the case with you. Tell me a bit about that. Danilo: The music I am hearing and writing required different tone colors. For Panama 500, my last project, I used the Guna's folkloric element, violin and cello, plus Panamanian percussion sounds. This added a fantastic color to the mix. Also with the narrations I used their voice and language as an inspiration to improvise and write music. To use music as a tool to send a message of dialogue and equality is very important to me, and as a UNESCO Artist for Peace it is already responsibility. Therefore in Panama 500 the Guna Indians taught me how little informed we are about history and that the discovery of the Pacific Ocean should be reviewed and studied as a rediscovery instead. Every project that I embark on I really like to focus on the elements that unite them: Africa, Europe and Latin American folklore. Don: I hope I'm not being presumptuous, but Chicago seems to be a special place for you. I'm going back to at least Panamonk, when I first met you, but even your first totally independent project Live at the Jazz Showcase was recorded here. Am I imagining that fondness? Danilo: No, you are right, it is a very special place because it has provided me with a lot of inspiration to write and play music. A lot of special commissions to write music and a lot of important collaborations in my musical life. I really have a special place in my heart for this amazing, creative city. Don: At this point in your career you could almost exclusively be a concert hall performer, getting paid well for one night's work, but you are doing the full four nights, two sets a night at the Jazz Showcase this week. Why? Danilo: It is important to me to keep experimenting, mentoring and reworking my craft, [and] the Jazz Showcase is an institution of jazz music and provides me with all these opportunities to keep developing. 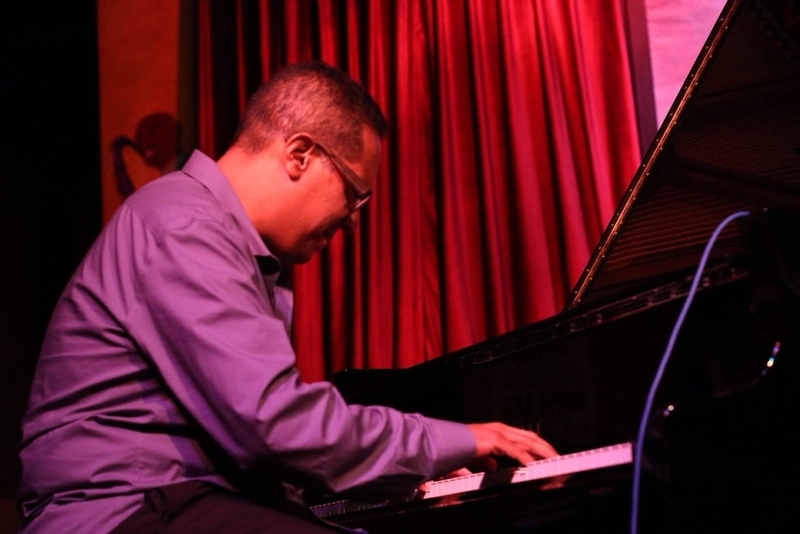 Danilo Pérez continues at the Jazz Showcase through Sunday, September 21. It's a busy music weekend in Chicago, but you should really find a way to get there and experience this amazing music and person for yourself. Trust me, you'll be happy you did.